I have been in Dallas, Texas for the past few days on a “missions journey” that went horribly, horribly awry. I don’t want to bore you (or those viewing this) with details, but let’s just say this was one of the worst, painful, and traumatic weeks of my 52 year old life. it was horrible. Yesterday, I took advantage of an idea and went on the tour of the Dallas Cowboys stadium. To call it a stadium is a disservice. I have visited several football stadium but there is nothing like the Cowboys facility in Arlington. First, I’ve never stood in a $1.5 billion dollar facility – and yes, it is all that! It is an engineering marvel. Not ONE obstructed view, wider seats, a jumbotron screen that is almost the length of the football field, a nightclub on premise, the largest NFL fan shop in the country, an art gallery, the home base for the Cotton Bowl organization, an art gallery, the Cowboys Cheerleaders locker room, home and away lockerrooms, 2,000+ Hd screens in the facility, a standing room area that will accomodate 12,000 extra persons – this is truly the 9th wonder of the world. The hospitality that I encountered was amazing. I met a sister in the pro shop who attends Pilgrim Rest Missionary Baptist Church where Dr. Curtis Wallace is the pastor, and she befriended me and mothered me like I was her long lost child. She kept on telling folk,”he’s just a big old teddy bear” with the sass of a country church mother. i believe if i had asked her for some collard greens and cornbread, she could have reached into her purse and pulled them out. To hear the details of the construction of this facility is amazing. Also to learn that Arlington, TX is the largest city in America that does not have mass transit was disheartening. it would be great to get a hotel in the area and catch a trolley to the stadium. When i heard that just last weekend you kindly opened the doors of the facility for a sleepover of cub scouts in the DFW area was very impressive. This arena has hosted the Cowboys, the Super Bowl, monster tractor pulls, bowling tournaments, boxing championships – and it’s only three years old. What an impressive start. Thank you Mr. Jones, This visit lightened a very burdened heart. 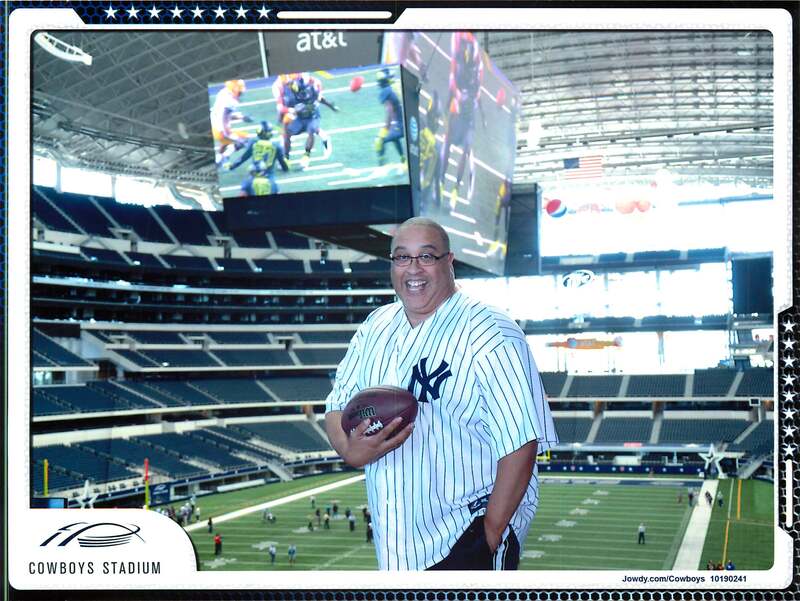 I have been a Cowboys fan since I was a teenager and to stand on the star at the fifty year line, with a football in my hand, and to have a photo made of it – it will be on my funeral program. When I realized that it takes a small army just to maintain, prepare and serve during a game – again it is even more impressive that a facility of this kind exists in our country. p.s. Now about the team on the field . . . . Thanks for visiting my city and the Cowboy stadium. There is a lot of history behind that stadium that don’t meet the eye. If you’re interested, give me a call. BTW, recently just found your blog and I love it. Thanks.